Bitcoin has been on the move down from $10,000. The recent couple of days, however, saw the decline decelerate. Does this have any bullish indications for the currency at the moment. We actually do have some strong ideas on this question and on the possibility that we might have already seen a local extreme. We would like to share them in this alert along with thoughts on our already profitable hypothetical positions. So, we would be very careful about claims that Bitcoin will trade at historical multiples of price to mining cost. Shifts in demand and supply might shift the multiple up or down. The multiple analysis might have some long-term implications but they are a lot weaker than one might suspect after simply reading about a $36,000 price target. On BitStamp, we saw a relatively significant move down from $10,000, to around $8,000. This was fallowed by some appreciation in the last couple of days. Are we seeing a meaningful reversal? In short, there’s not much to support such a point of view, in our opinion. First of all, even if we take a look at only the recent rally from around $6,500 to around $10,000 (April-May) and draw the Fibonacci retracement levels on the short-term chart, we see that Bitcoin is now below the 38.2% retracement level based on the April-May rally. This means that even from the short-term perspective, we don’t see a lot of evidence of a reversal to the upside. What we’ve seen so far supports a further move to the downside as the breakdown below the 38.2% level is now verified. If we look at different Fibonacci retracements drawn based on longer time horizons, the implications do not change and we haven’t really seen any important breakout suggesting a move to the upside. To the contrary, all the short-term signs point to the downside. Have We Seen a Local Top? On the long-term Bitfinex chart, we can compare the recent move down with other moves we had seen previously. In general, the recent action is nothing spectacular. But it might be at least mildly important for the next move in the market. What we saw during the recent rally was a breakout above the 78.6% Fibonacci retracement, which could have been viewed as a resistance level. This was not a very bullish development as the level is not a particularly important one as far as strong moves up are concerned but what followed does have bearish implications. 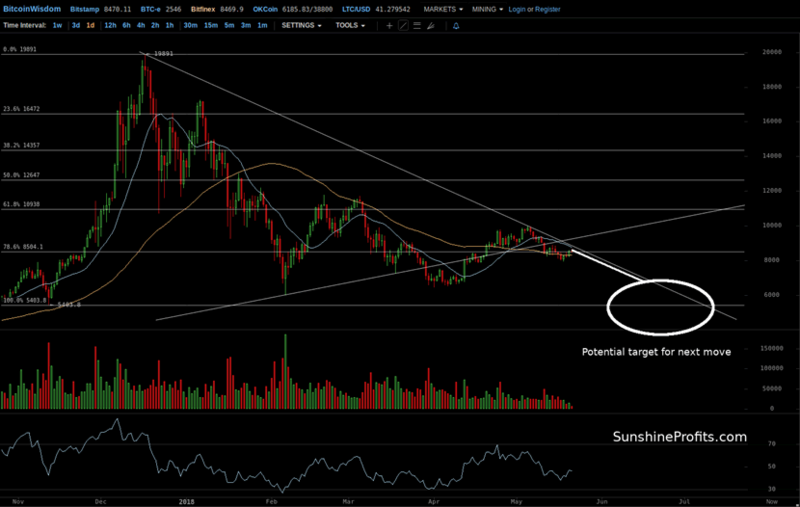 Namely, Bitcoin reversed course, move down below the 78.6% retracement and invalidated the breakout above this level. Even though the level itself is not of primary importance, the whole move adds to the bearish implications. This might mean that the recent move up is over and we might have already seen a local top at around $10,000. Mind that all the other implications based on Fibonacci retracements are bearish and actually have been bearish for some time now. Adding to that, we are below the new declining trend line based on the entire decline from around $20,000 and below the rising support level based on previous local lows. It does seem that the local top might be behind us and Bitcoin might have more room to decline, and the profits on our hypothetical positions might grow even further. Summing up,we might have already seen the local top and the decline might resume.